Created in collaboration with Audrey Crane, Jim Faris, and Harry Saddler. This diagram explains Java by placing it in the context of related concepts and examples, and by defining its major components and other connections between them. The diagram is intended to help developers who are familiar with one part of Java understand other parts. It relates unfamiliar technologies to ones with which developers may already be familiar. The diagram also provides an overview for developers who are new to Java and an introduction for non-programmers who want to improve their ability to converse with developers. The completed map contains approximately 235 terms, 425 relationships, and 100 descriptions. We also created a Flash version of the map. Read the article Using Concept Maps in Product Development: Preparing to Redesign java.sun.com. The Sun font is available for sale from the Lucas Font site and from other font providers. 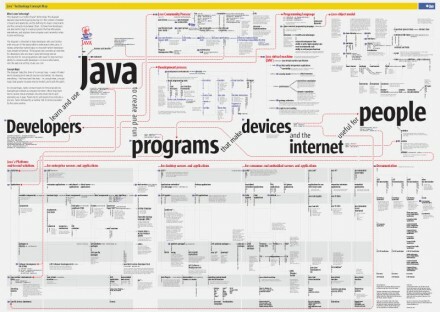 I have had this poster on my wall since I obtained a copy at a JavaOne conference. Now I know who pieced it together. A a very visual thinker myself, I admire this and the other models you have produced. 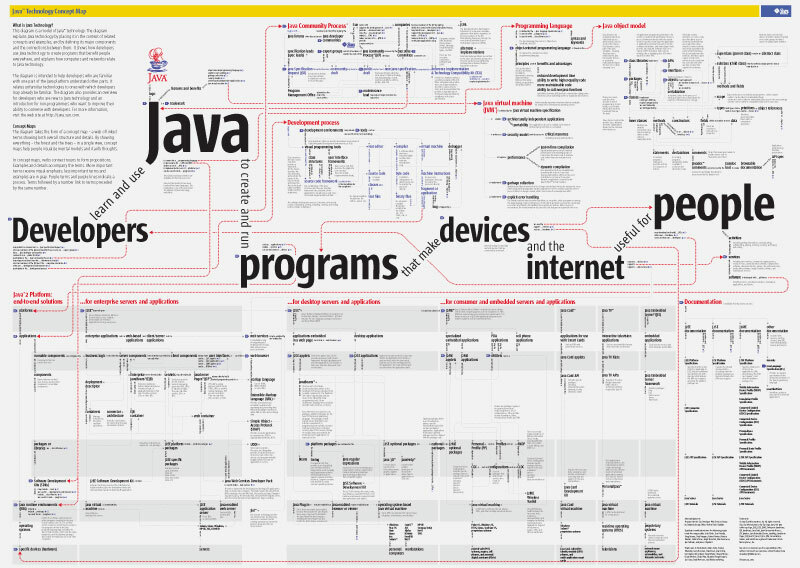 Is this Java Concept Map still relevant / up to date? I see this concept map is from Feb 2003. I’d like to share this with my team but wanted a sense for how up to date it is.